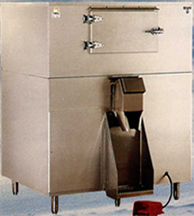 commercial ice baggers | industrial ice dispensers | ice storage machines | large ice bins | Mannhardt, Inc.
Mannhardt Ice located in Sheboygan, Wisconsin has been a national leader in the manufacturing and supply of industrial and commercial ice storage and dispensing bins since 1929. Over the years, our customers have come to depend on the quality workmanship, innovative thinking and superior service we provide time and time again. 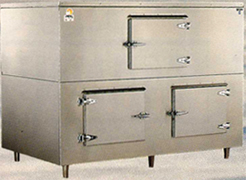 Looking for an industrial capacity ice bin dispensing system or a commercial size/grade ice bin? Look no further. Mannhardt Ice does not manufacture units for residential use. Instead we specialize in industrial-sized ice dispensing units to meet the needs of various customers throughout the United States. As a preferred supplier to the United States Military, we are confident that we will not only meet your expectations, but exceed them in regards to quality, engineering and durability. 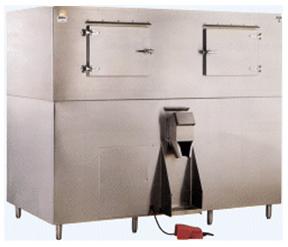 Who Depends on Mannhardt Ice Dispensing Systems? If you are in need of providing high quality ice every day, with virtually no effort, look no further. Mannhardt Ice Dispensing Systems deliver. Count on us for high quality industrial ice dispensing units with limited hands-on care. Need help navigating the ice field? If you're lost and don't know what type of ice dispensing unit you need, contact us today. We'll be happy to guide you!